One option for running on unfamiliar Icelandic trails is to run with a local company that specializes in guided tours. Our friends at Arctic Running offer many kinds of running tours. Here is an article from one of their guides, Birkir Már Kristinsson. As a running guide at Arctic Running, I have the privilege of running through the most amazing landscape with people that have never seen Icelandic nature before. There is a clear pattern in the reaction and feedback I get; everyone rates the adventure as their favorite run of all time! 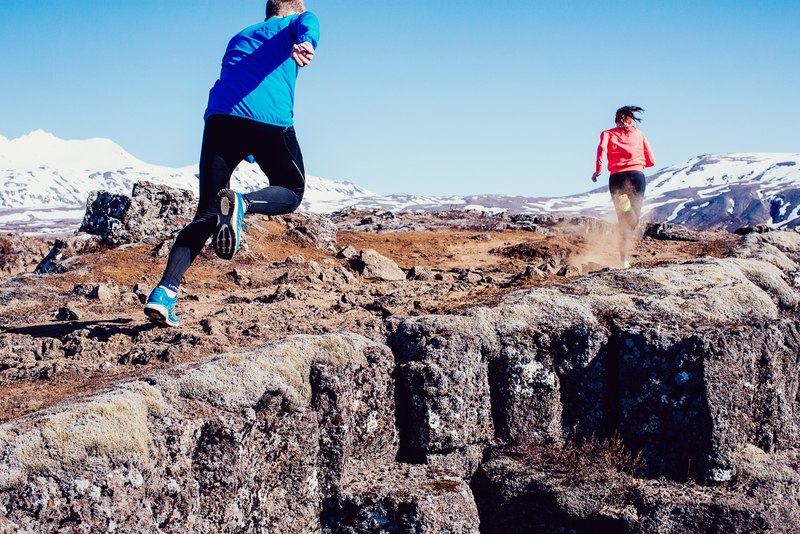 Discover Icelandic nature through guided running! As wonderful as running in the city of Reykjavík is—and all customers I’ve run with have been truly happy with their city runs—it lacks the uniqueness of running in raw Icelandic nature. That’s what really leaves people amazed. And there is no better way to experience nature than by running through it. If you are anything like me, trail running is all about adventure and challenge. It’s about discovering a hitherto inconceivably beautiful trail that is enough of a technical challenge to keep the primitive caveman or cavewoman in you happy. Imagine three days of such an adventure, where each day surpasses the next in awe and wonder. All you have to do is run and enjoy. Food and lodging is provided and your stuff is taken care of and your guide cheerful guide will make sure you get the most of your trip. Wait a minute, isn’t discovering your own trails part of the fun? Yes, that’s true. And if you stay in Iceland for a few months, I would encourage you to do just that (provided you’ve done your homework). But if you’re coming for a limited time, you might think about hiring a running guide to ensure you get as much as possible out of your adventure. In fact, along with: “This is now my favorite run of all time”, the most common feedback I get from people is: “Man, I’m glad I didn’t do this on my own”. A lot of our customers tell us they were thinking of discovering running routes for themselves. But they are all relieved they decided to hire us. One reason is that you are unlikely to find the most beautiful routes without a local guide. Another reason—a more sobering one—is that Icelandic nature is still so raw and untouched that it can be really easy to get lost, especially if you want to venture out of the most common trails. Is your favorite run of all times just around the corner? So, if you are looking for that once in a lifetime, unique, awe inspiring running adventure, look no further. I haven’t met a customer yet whose response wasn’t something like: “This was by far my favorite run ever” or “This was much better than I expected”. Check out our website and run wild! What is your favorite trail run so far? It would be fun if you would comment below and share your treasure with the rest of us. Birkir is an Arctic Running Guide and a practicing physical therapist. He has participated in various running events spanning 10K to 50 miles with good results. Running in the middle of scenic wonders of nature, however, is by far his favorite type of running. Birkir speaks excellent English, Swedish and (obviously) Icelandic.